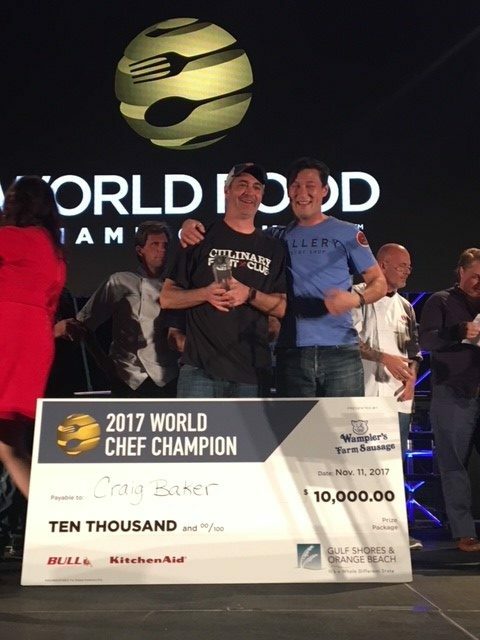 Over 450 teams from around the country and the world recently came together at the World Food Championships in Orange Beach, Alabama to show off their culinary skills. Chefs and cooks competed to be crowned champion in ten categories ranging from steak to dessert. Their backgrounds varied, but they had all qualified for the largest competition in Food Sport, giving them an opportunity to be named World Food Champion. One of the teams that emerged as champions was the Indianapolis-based member duo of Craig Baker and Ben Hardy. Both can be found perfecting their craft in Broad Ripple. Craig is the owner of Bent Rail Brewery, while Ben is pastry chef at Gallery Pastry Shop. Fellow members Red Gold and Maple Leaf Duck sponsored their team. The dish that crowned them champion in the best chef category at the recent semi-finals was Berries & Cream with Candied Nuts and Strawberry Basil. It also secured them a spot, along with the nine other category champions, at the Final Table competition next spring where they will participate in a live-streaming, timed cooking challenge for the top award. The World Food Championships began in 2012 and is responsible for the creation of “Food Sport”, giving attention and respect to the culinary elite and industry as a whole. In order to be invited as a competitor, one must either win a qualifying competition, publication award or receive a special invitation by way of one of four categories.